Although I have been to Antequera many times. It has taken a while to actually discover everything that this Malaga town has to offer. 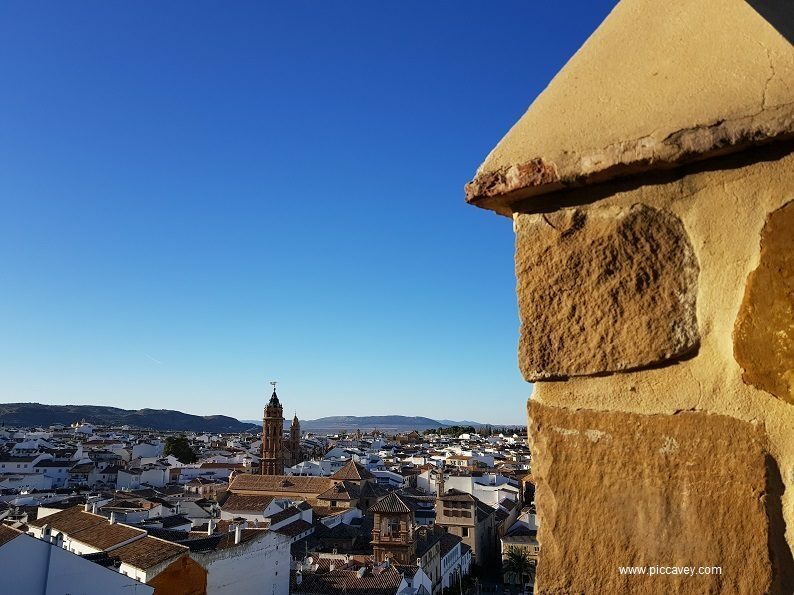 In November 2017 I revisited Antequera to see the Alcazaba which I not be able to visit before. Now I have actually see all the main sights, so I´m sharing my findings to help you plan you visit. 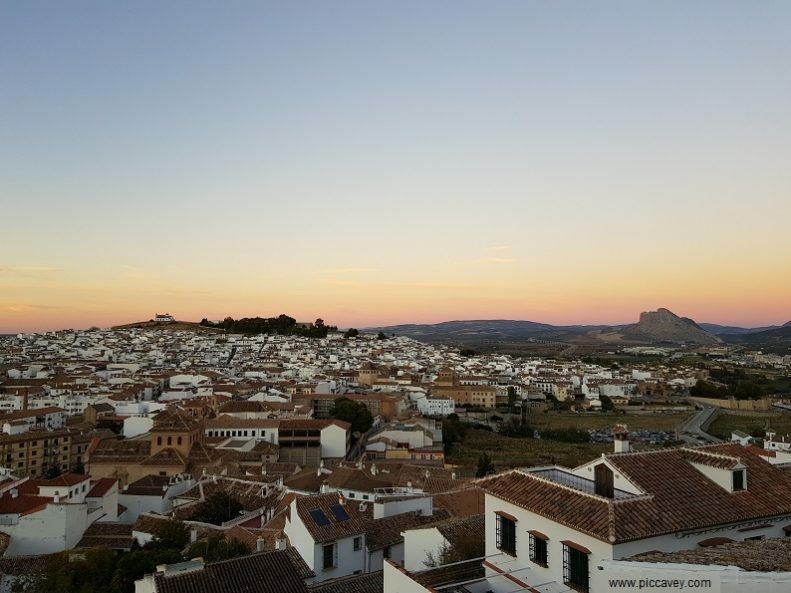 Antequera is located in the middle of Andalucia. Surrounded by countryside this makes a perfect weekend getaway to explore inland. With plenty of grand churches, interesting hikes and fabulous local food. 48h is the ideal amount of time to spend here. 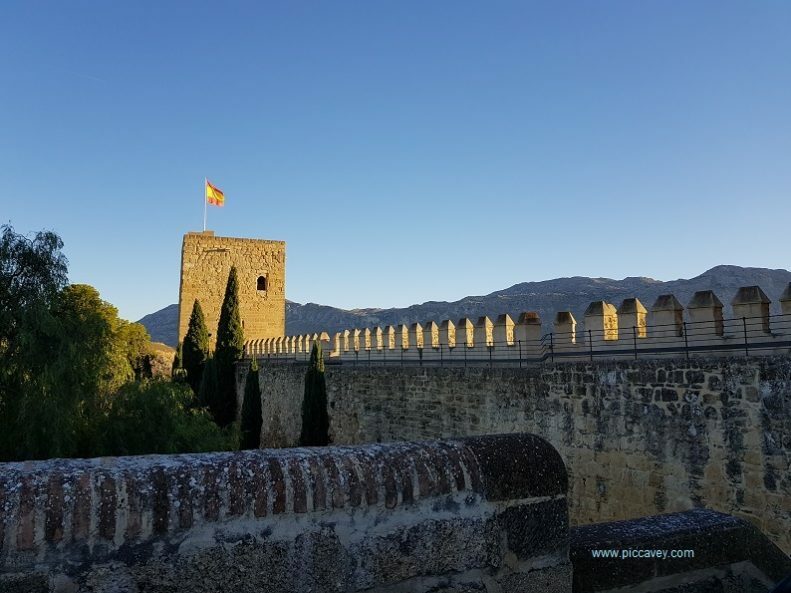 As you may know Medieval Fortresses appear in other Andalucian cities. Locations as Granada, Almeria or Malaga all have their Alcazaba. Built in 1582 the Homenaje tower is the most important part of the fortress. From above you can see across the landscape and over the town. The Giants Archway (Arco de los Gigantes) is also pretty impressive just outside the Alcazaba. Built in 1585, it takes its name from large sculptures that once stood here. 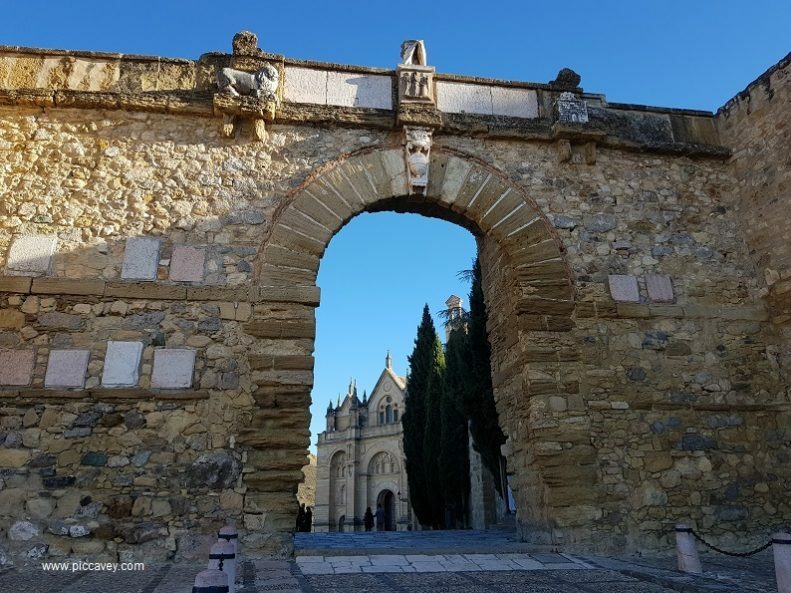 Topped with a Vase of Flowers, a Lion and the city coat of arms, this gateway opens towards the Colegiate Church of Santa Maria and the Alcazaba entrance. It also frames it rather nicely too. This imposing building just below the Alcazaba was the first renaissance style church to be built in Andalucía. Completed in 1550 the facade is very impressive and inside you can see an audiovisual show which explains some of the history of this builiding. You can also see an old Tarasca figure. A typical symbol in some festivals around Spain. The curious figure is half dragon and half woman. Discovered in 1988 this site was from the 1st century. Used as a Thermal spa open to the Public at the time. 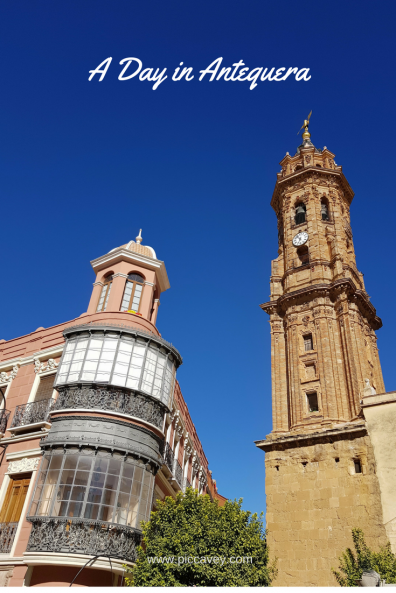 As I wandered through the main streets of Antequera I saw this fabulous church tower. Named in Spanish as the Colegiata de San Sebastian it´s tower is really ornate. Built in the 1540s I couldn´t help taking a few photos of this eyecatching spire. 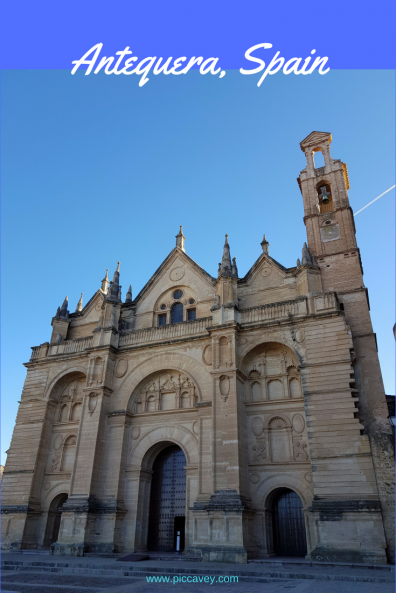 Antequera is known as the town of churches. With 33 churches in this location, there are more churches per person than anywhere else in Spain. 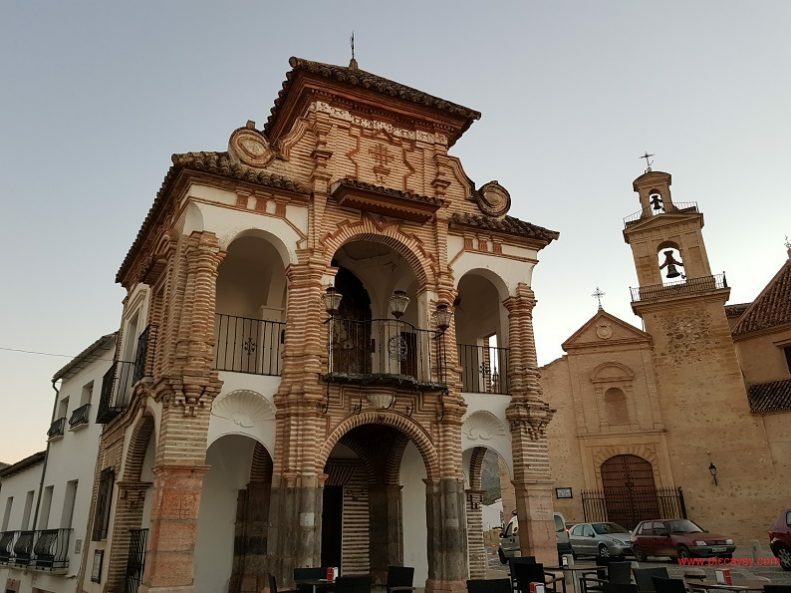 The City Museum in Antequera (MVCA) is right at the centre of the old town. Set inside the Najera Palace. 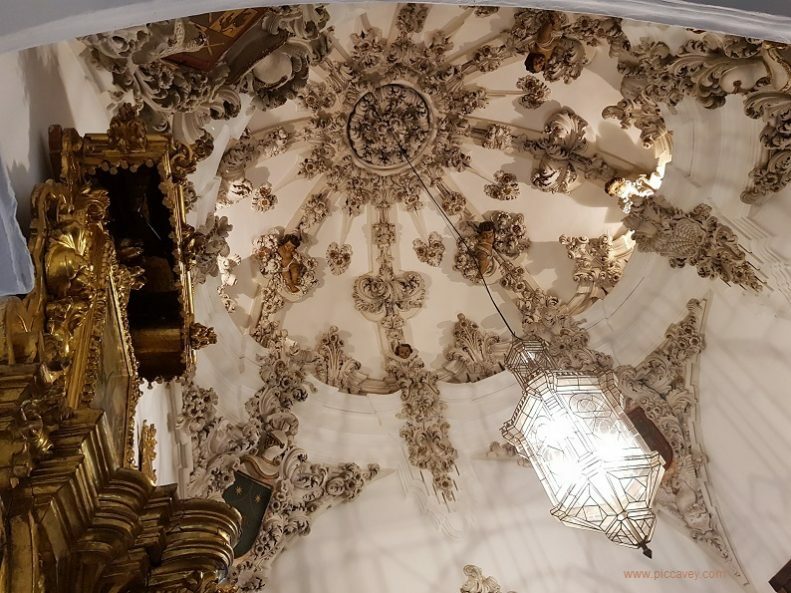 The Museum of Antequera site is worth seeing, even if its just for the architecture inside the palace. Built in the 18th Century as a palatial home the dome topping one of the staircases caught my eye. The museum offers interesting exhibits from different ages of Antequera. Along with Roman sculptures and religious art from the region. As you drive towards Antequera you notice this imposing rock on the horizon. Shaped like someones face viewed from one side this is called the Peña de los Enamorados in Spanish. They also call it the Montaña del Indio due to its resemblance of a Native Indian Mans face. This has an important landmark for very long time. One of the Dolmens faces this rock, rather than the direction of the sunrise so even all those ages ago it was important. A beautiful muslim girl named Tagzona was promised to the ruler of the Alhama Castle. However she was already in love with a Christian man from Antequera. While visiting soldiers in prison she had helped him to escape. They ran away together but were followed by Moorish soldiers. When they reached the top of this limestone rock, instead of being captured, they threw themselves off the 800 metres drop holding hands until the bitter end. “Death, Manuel, shall set us free! In one another’s arms they died. To mark the victims of despair. Says for Manuel’s soul a prayer. 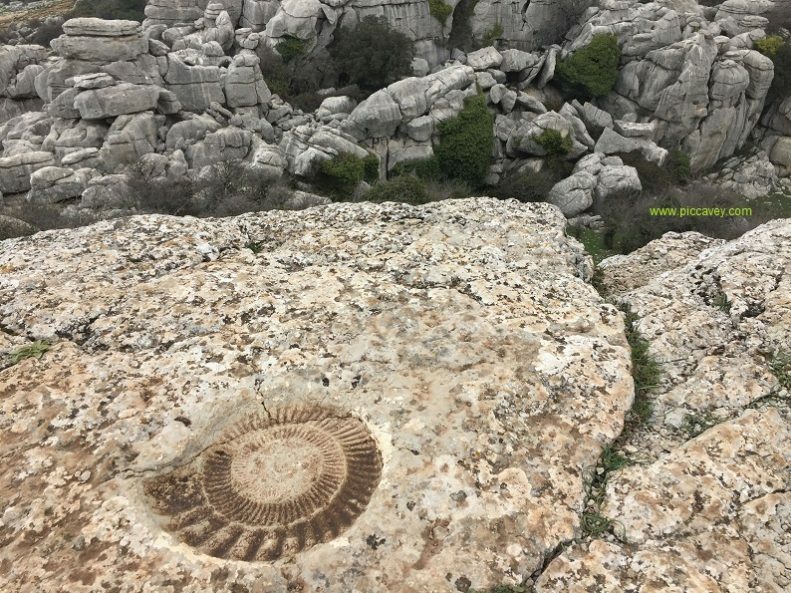 This curious park close to Antequera is full of strange geological shapes. 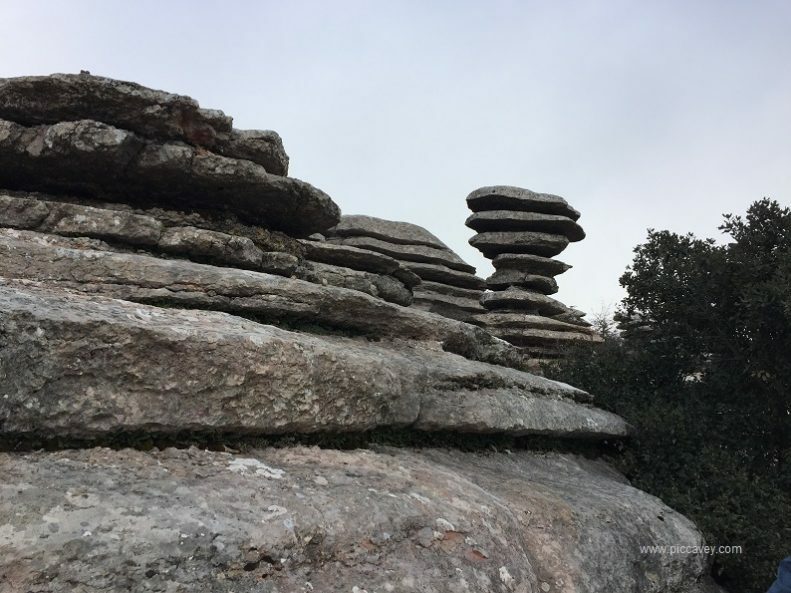 When you get up to the Torcal of Antequera it can be cooler and misty. There can even be thick fog. Despite it being warmer or sunnier in the town, in this region weather can change quickly so take layers if you plan to visit. There is a visitors centre and car park as you arrive to the main entrance to thepark. Here there is a good café serving hot food and also a small shop. 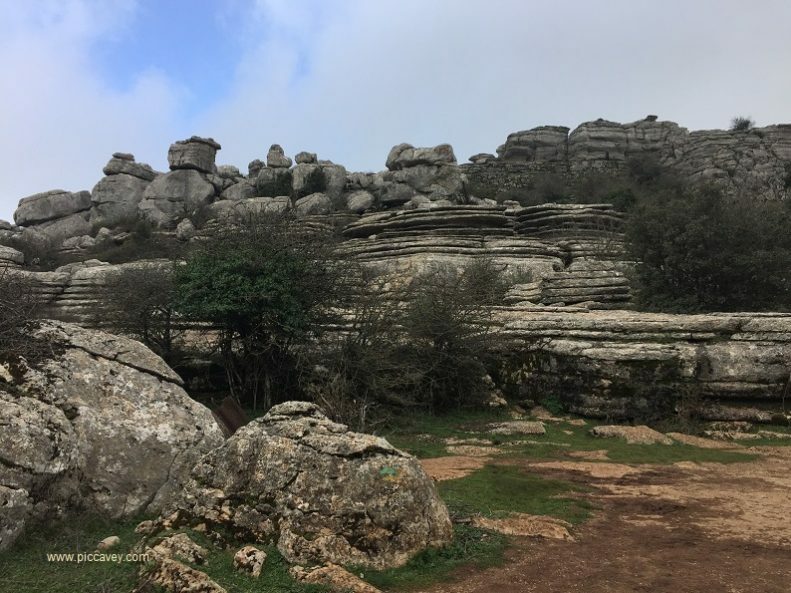 If you plan to hike one of the different routes around the Torcal, get the detailed information that you need to plan your visit. Some of the routes are Self Guided, public trails and others can only be done with a guide. As this is a protected space and a UNESCO World Heritage site it is important to protect and respect the park. Enjoy seeing shapes in the different rock formations and spòtting fossils such as this ammonite along the way. 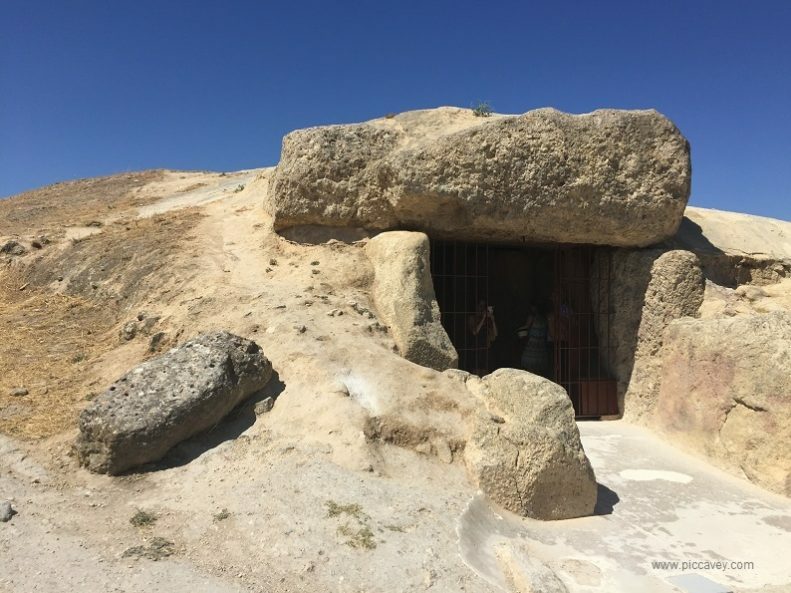 The Dolmens of Antequera are a fascinating discovery. There are three to visit, El Romeral, Menga and Viera. The Tholos de Romeral seen here is located on the other side of the town. You can drive to see the Romeral site. It´s just a short distance from one to the other. This was built 1800 BC and was a megalithic burial site. As with the other two you can actually go inside and see it for yourself. I find it fascinating after all these centuries that we can still see this now. 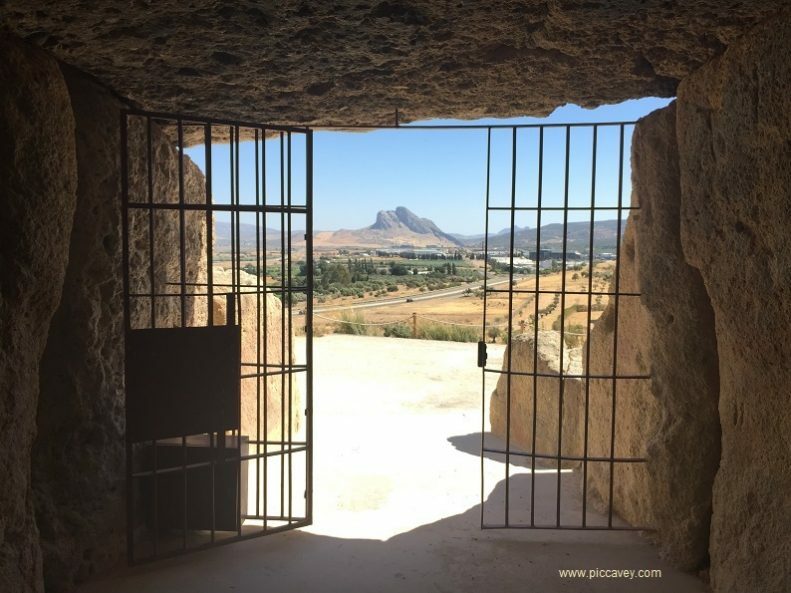 The wonderful thing about visiting the Dolmens in Antequera is seeing the difference betwee the three constructions. Since being included in the list of UNESCO World Heritage sites this area is busier than it was before. I would plan my trip first thing in the morning if possible before the crowds arrive. 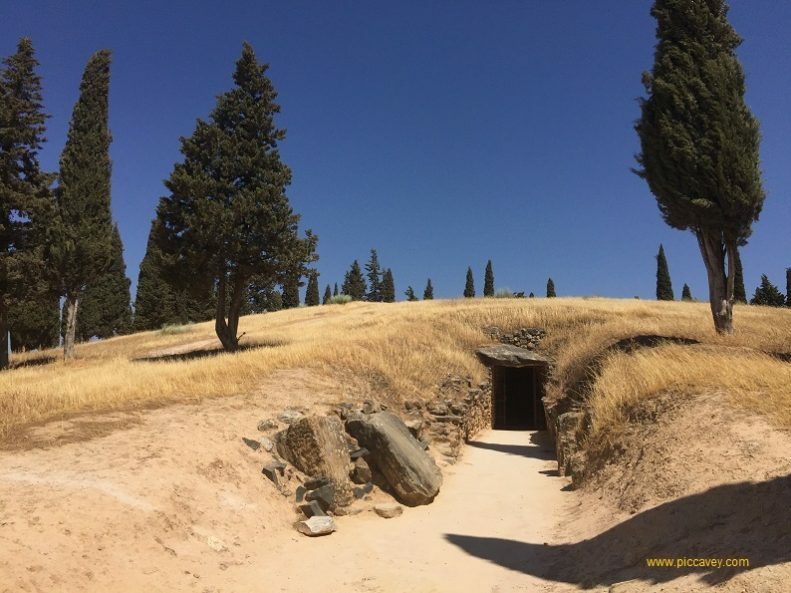 The Antequera Dolmens are outside so be sure to wear sun cream and good footwear for the visit. As with most locations in Andalusia the food in the region is excellent. 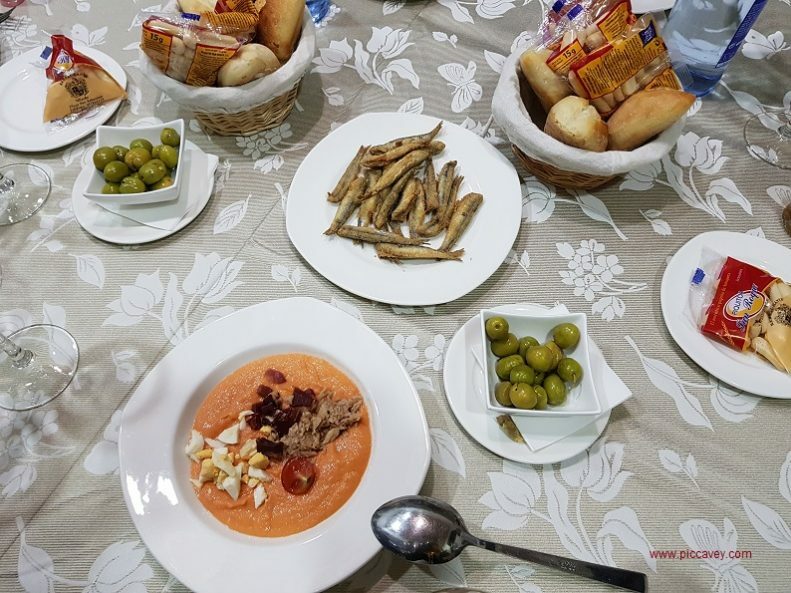 Local delicacies specific to Antequera are the Mollete de Antequera. A flatbread which taste wonderful with local Olive Oil drizzled on top. The Porra Antequerana may look like Salmorejo, a thick chilled tomato puree however but the ingredients do vary. Porra has bread in the mixtur, it is very thick and filling. This dish is good for warmer days when you need to eat something filling but temperatures are high. Also look out for the biscuits and pastries from La Antequerana a local bakery that sells it´s treats across Spain. Especially around Easter and Christmastime. On my different visits to Antequera I have eaten at several different places. Restaurante Reina – This traditional restaurant on Calle San Agustín gets quite busy at weekends with family groups. The portion sizes were very generous here. The variety of fish, meat and other dishes was quite overwhelming so something for everyone.